"Tell me about your game," said Fred Griffin, who is the Director of the Grand Cypress Academy of Golf. I felt like I was in front of a psychiatrist or maybe the plastic surgeon on TV's Nip-and-Tuck who is always asking potential clients the proverbial "What don't you like about yourself?" Well, I unloaded on him all of my concerns and failures, which in golf are many. Inconsistent putting and iron-work and an alarming lack of wood expertise were the basis of my high handicap. Fred evaluated my commentary and then seemed to focus squarely on my poor driving skills as a starting point. "At this Academy, unlike at some others, we believe that your success at the game of golf starts with your performance at the tee," he pointed out. "It is not something to neglect or underprioritize. Let's have a look at your swing." We moved into a large room of the Academy to his ModelGolf teaching system area where I had only a one hour session to derive as much benefit as possible from his skillful analysis and instruction. With my problems, that would obviously not be enough, but I hoped to pick up some help from his quick overview of the academy teachings and the school highlights that they offer golfers of all skill levels. After entering several individual parameters such as my height, weight, age, etc., we worked on my full swing with my driver. A couple of slow-motion cameras recorded my swing from different angles and a computer system analyzed it. A biomechanic computer model overlay and split screen helped us see my exact problem areas during the 14 points of the standard swing. Ball speed, club speed, and a bunch of other statistics were documented for each ball that I hit. Fred noted what my strengths were and of course my weaknesses. He suggested an ideal stroke and stance for me with a driver. Fred got into some of the analysis parameters and how they affected certain facets of the swing. Thank goodness, I have an engineering background. That's not to assume that I understood the analysis but at least the terminology was not foreign to me. Then as adjustments were made to my stance and swing, a "before and after" comparison could be reviewed right on the computer. My instructor even suggested a better club for me based on my body dimensions, swing tendencies and club preferences. He selected one that had a different shaft flexibility and club face slope for me to try. I quickly noted the difference in club speed, ball speed and projected distance of my drives. Griffin played a key role in the development of the innovative ModelGolf system at the academy, which seemed to be very helpful, much more so than other teaching systems that I've seen elsewhere. 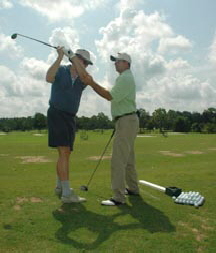 The Golf Academy, rated among the top golf schools in America, boasts award winning instructors like Fred and also offers online review of the on-tee lessons at www.modelgolf.com. At the website, academy participants can access their swings, the instructor's analysis, specific improvement drills, set-up dimensions, club recommendations and much more. The 21-acre practice facility at the Academy features 3-, 4- and 5-par holes designed specifically by Jack Nicklaus to offer a "hands-on" challenge of the game. You can practice uneven lies, fairway bunkers and everything else that you might encounter when you hit the 18-course. 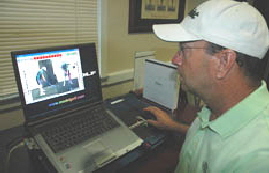 Griffin founded the academy in 1986 and, over the years, has won many accolades and awards from the golf community. He was named "Teacher of the Year" by the PGA of America's North Florida Section and voted one of the top 100 Teachers in America by Golf Magazine and ranks among the top 50 by Golf Digest. He is a frequent speaker at PGA teaching and coaching seminars and he teaches exclusively at the Grand Cypress Academy of Golf. Griffin hand-picked each of the teaching pros that are part of the Academy, where classes are limited to eight students per group. Academy memberships are available and offer a variety of benefits, including several Golf Schools that are scheduled throughout the year. Information on individual lessons, golf club fittings, and other events is available by contacting Grand Cypress Academy of Golf, 1-800-790-7377 or by emailing resortinfo@grandcypress.com. Visit their website at www.grandcypress.com.